Above graph, based on NOAA data, shows a polynomial trendline pointing at an October Northern Hemisphere sea surface temperature anomaly rise of more than 5°C (9°F) by 2050, compared to the 20th century average, from an earlier post. The North Atlantic is warming rapidly, with sea surface temperature anomalies as high as a 12°C (21.6°F) recorded east of North America earlier this year, as illustrated by the image below. 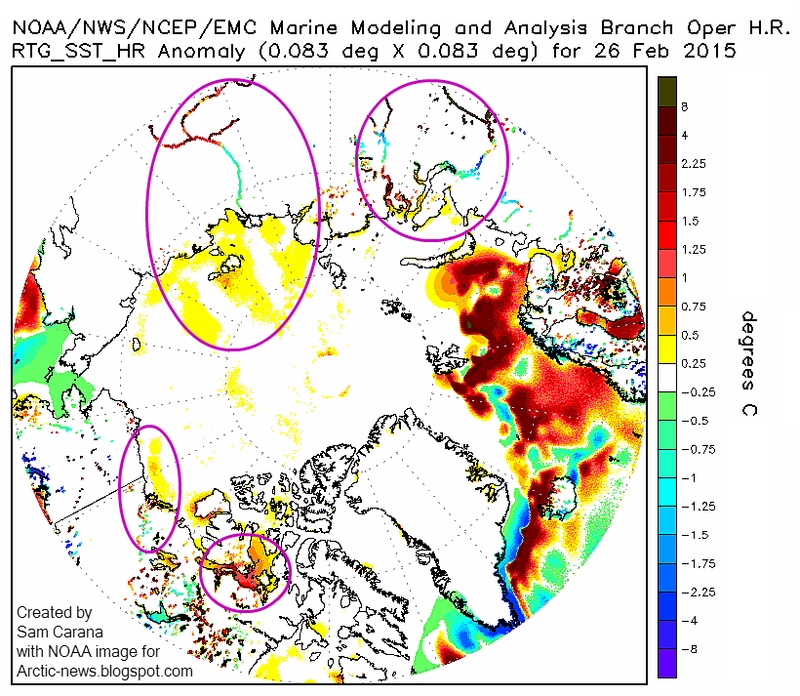 A further contributor is a warmer North Pacific. Emissions by people are not only causing temperatures of the atmosphere and oceans to rise, they are also causing winds and ocean currents to change. Such changes can in turn result in heatwaves that are more intense and that persist for prolonged periods. 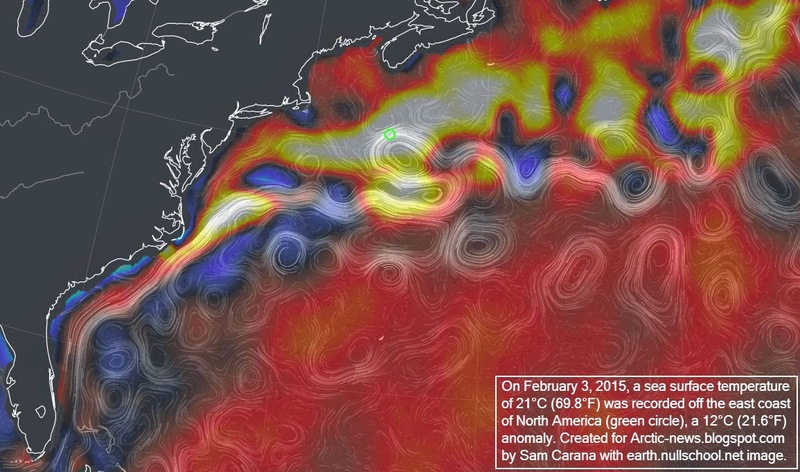 Furthermore, strong northbound winds, combined with strong precipitation and waves can speed up the volume of warm water carried by Gulf Stream into the Arctic Ocean, as discussed in an earlier post. 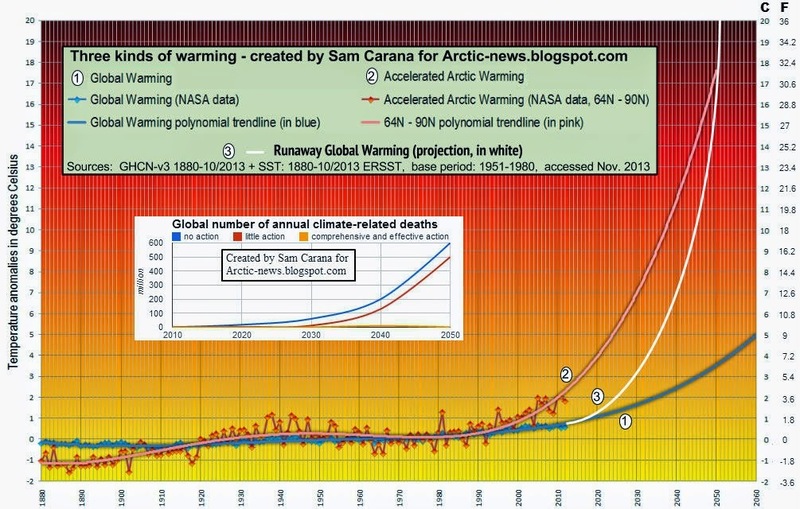 A warming atmosphere, warming oceans and decline of the Arctic snow and ice cover all go hand in hand. The IPCC concluded in AR5 that, for RCP8.5, the Arctic Ocean will likely be nearly ice-free in September before mid-century. 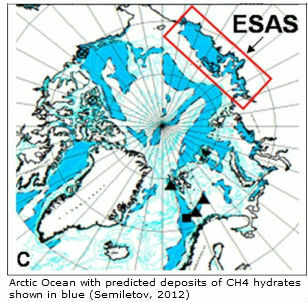 Prof. Peter Wadhams warned, back in 2012, that the Arctic Ocean could be virtually ice-free within a few years. 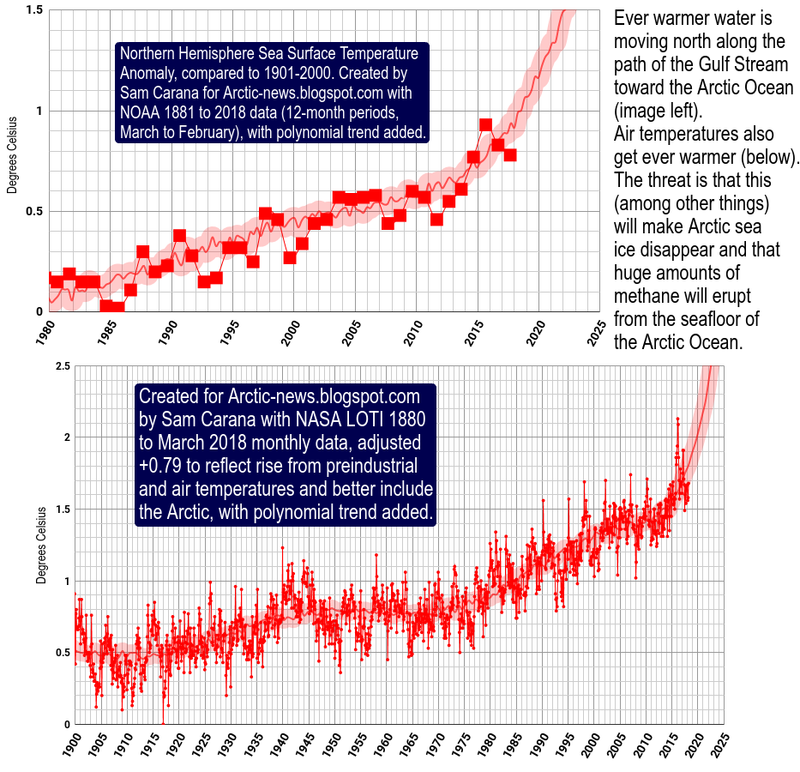 An exponential trendline based on sea ice volume observations shows that sea ice looks set to disappear in 2019, while disappearance in 2015 is within the margins of a 5% confidence interval, reflecting natural variability, as discussed at the FAQ page. 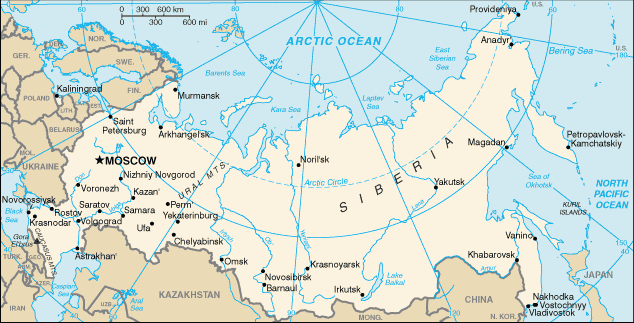 Permafrost decline will cause Arctic temperatures to rise, due to albedo change and due to carbon that is contained in the permafrost and that can be expected to be released in the form of methane or carbon dioxide as the permafrost thaws. 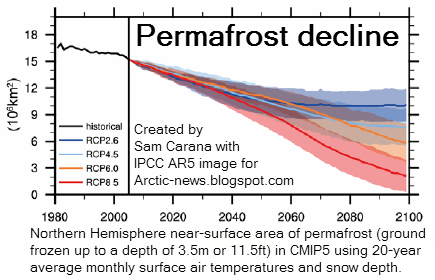 The image below pictures permafrost decline as foreseen by the IPCC in AR5. 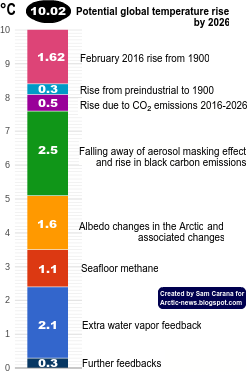 Obviously, rapid decline of the sea ice will come with albedo changes that will also make the permafrost decline more strongly than the IPCC foresees, while they will also cause even more extreme weather events. 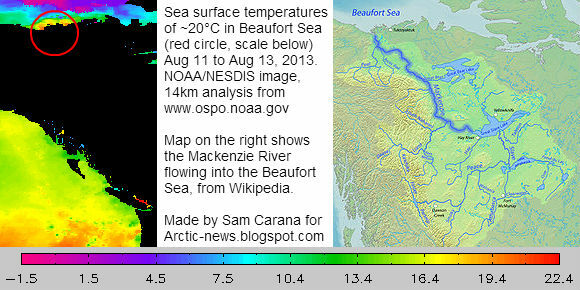 One of the dangers is that huge amounts of warmer water will flow from rivers into the Arctic Ocean, as discussed below. Another area of concern, also marked with a purple oval in the image below, is located in the north of Canada. 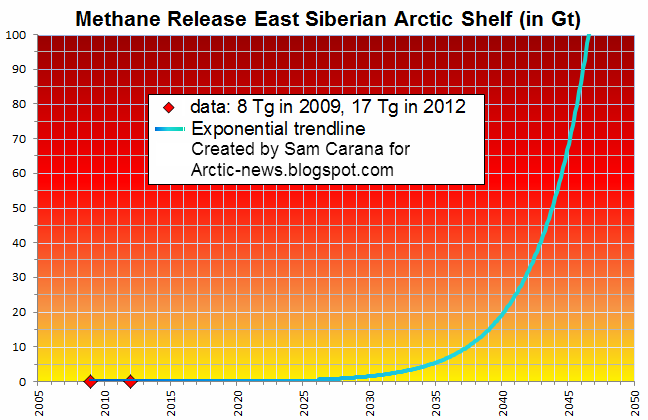 The image below shows exponential rise based on data of East Siberian Arctic Shelf (ESAS) releases alone, as discussed in an earlier post. 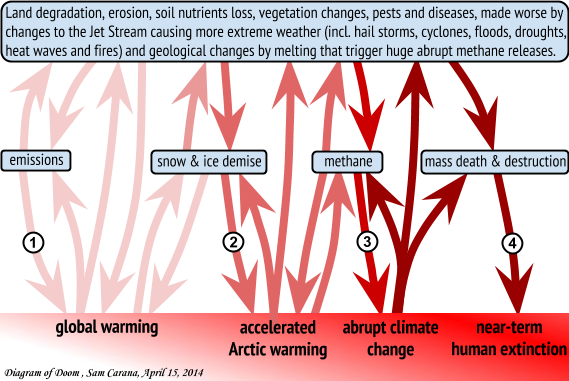 Non-linear rise is supported by the fact that methane's lifetime increases as more methane enters the atmosphere. 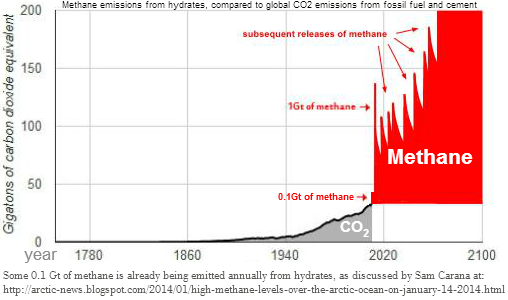 As the image below shows, peak methane levels have been very high recently. Rapidly rising temperatures will cause stronger evaporation of sea water. Since water vapor is one of the strongest greenhouse gases, this can further contribute to the non-linear temperature rises pictured above. Thank you very much Sam. As always, excellent work. Where I live, in Saguenay Quebec, we still have very cold temps since early January. -20°C to -30°C nights predicted till march 6th!!! It's way more than unusual. On Mr Soon issue, I learned last night that he was one of the scientist (while in fact he's an Aerospace engineer) in the IPCC; holy crap! I saw part of an interview last night of Chris Hedges, he was talking to Abby Martin about Climate Change, the IPCC and Govts in general. He said: "If we trust within the system, they'll kill us." The hardest part is to get peoples attention, but you surely know that. Nevertheless, lets keep trying! I am confused. I thought that global methane levels in 2014 were at 1840ppb (based on Guy McPherson) with some parts of the Arctic showing levels at around 2500ppb. However, your article appears to show global levels at 2500ppb. have I missed something here? Could you clarify please? 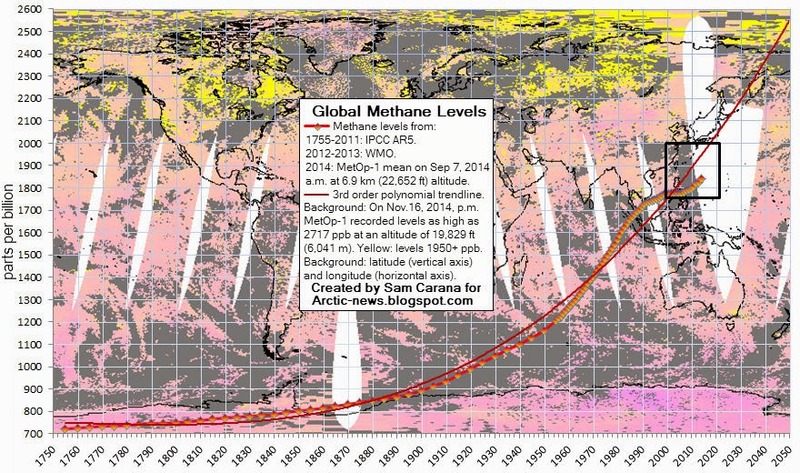 Mean global methane levels go up and down over the course of the year. On the morning of September 7, 2014, mean global methane levels of 1839 ppb were recorded by the MetOp-1 satellite at altitudes from 6.9km to 8.1 km, as mentioned on the 1999-2011 image in the middle of the post. Peak methane levels are much higher than the mean global levels. On November 16, 2014, a peak methane level of 2717 ppb was recorded, as mentioned on the 1750-2050 image underneath. The image further down shows peak daily global methane levels recorded by the MetOp satellites in February 2015, i.e. the highest level recorded for each day. 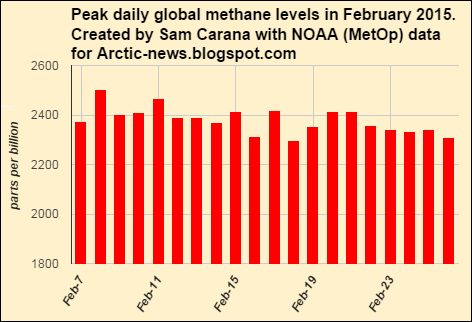 Peak methane levels have been very high throughout February 2015, as well as late January, 2015. 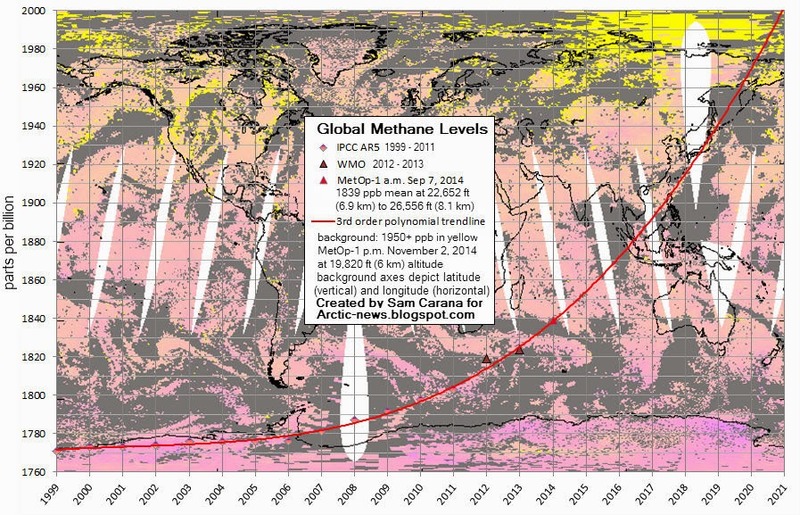 MetOp-1 recorded methane levels as high as 2503 ppb on January 31, 2015. pm, at 586, with a mean of 1807 ppb, as shown on the image at https://www.facebook.com/photo.php?fbid=10155077158550161&l=1640d42c81, while it recorded mean levels of 1810 ppb that afternoon from 451 mb to 487 mb. On February 28, 2015, by comparison, mean methane levels as high as 1917 ppb were recorded from 433 mb to 469 mb, while levels over 2400 ppb were recorded from 266 mb to 545 mb, with a peak of 2432 ppb at 367 mb. Let's hope the world as disorganized as it is decides to create mechanism for putting fullest effort into reversing the Extinction event acceleration. Imagine the engine for new industry and retooling that would bring and the benefits indirect and direct to the well being and keeping of hope alive that would bring. Internet communications can allow good ideas to flow into a program for quality improvement sustainable.. Certainly it is a duty, high to defend our home..